Matthieu Ricard is a Buddhist monk. After completing his PhD in cell genetics in 1972, he has lived for 50 years in the Himalayas and studied with many of the great Tibetan masters, including Kangyur Rinpoche, Dilgo Khyentse Rinpoche and the Dalai Lama. He is a translator of Tibetan texts, an author of several books, and has done some long retreats. He started Karuna-Sechen, which has helped more than 200,000 people in Northern India, Nepal and Tibet. He is an accomplished photographer, and his photos of the Himalayan region and its culture have been collected in several books. He is a member of the Mind and Life Institute which explores the intersection between contemplative traditions and contemporary scientific inquiry. We met while he was recently in London. I wonder if I could ask you first for your sense of what Tibetan Buddhism tells us about the power and potential of imagination? Not much that I know of! (laughs). Well, it depends what you call imagination. Of course everyone uses his or her mind to consider the future, and imagine what it is. Just in worldly terms, not too much anticipating the future is ranged among the ‘Worldly Concerns’. Hope and fear. Mind, there are eight. Gain and loss, pleasure and pain, fame and obscurity, and praise and criticism, but they boil down to hope and fear. A practitioner will avoid ruminating the past, and anticipating too much the future, not too much brooding about the future. That kind of imagination would be discouraged as a source of inner mental scattering and distraction. Now of course anyone who’s alive needs to have a vision for the future, a sense of direction. Then we stress the importance of first the motivation – am I doing that for just myself, or also for others? Is it for the smaller number of others, or the largest number? And is it for the short term or the long term? Ideally, our words, actions, thoughts, plan, imagination, should be for the greatest benefit of the greatest number of people, for the long-term. In that, of course, you have to consider what could be the effects. The fate of the people. But rather than pure imagination, Buddhism stresses what you call ‘valid cognition’. The analytical path of Buddhist investigation, which is okay: let’s see clearly what are the causes and condition involved. Knowing that we start from an altruistic motivation, what would be the best possible outcome according to the knowledge, that might be limited, what I have, but with the certainty that I’m generating an altruistic motivation. You cannot be sure what’s going to happen, but you can make sure that you check your motivation. That’s more based on an analytical mind and some degree of wisdom if you have. Then, when that is clear, the aspiration to accomplish a worthy goal follows the motivation, the sort of determination to do it, to engage in the journey to actually bring happiness to others. Then the other factors, like perseverance, determination, resilience, courage, come in place. In that sense, you could say it’s more based on common sense, sound reasoning, compassion and, if possible, wisdom. Then there’s another aspect in the practice, which is not really imagination, but maybe related, which is visualisation. You might visualise all sentient beings and then train again and again to generate loving kindness and compassion. You imagine them, but it’s really creating a mental image, not just imagining what the future would be. It’s nothing to do with that. It’s probably more proper to call it visualisation. Then you would visualise some wisdom deities, which are not some deities sitting somewhere out of space, but the manifestation of the Buddha’s wisdom, of the Buddha’s compassion, of the Buddha’s power to help the beings. You have different deities, and each of those deities, they are aspect. How many faces, arms, feet, they might have, it’s highly symbolic. The Buddha of Compassion, Avalokiteśvara, the four arms represent loving kindness, boundless compassion, boundless rejoicing and boundless impartiality. It’s not just a strange guy with four arms! The peak of Jitch Drakey reflected in Lake Tsophu. Photo: Matthieu Ricard, 2007. But the power of visualisation to bring those things into reality? It’s more like creating mental images and saying, “Okay, I’m not just imagining that. Actually this is my real nature because of the Buddha nature within.” This is not some superimposition of my own fancy imagination. I’m just actually a tool that helps me to recover my Buddha nature. It is actually rediscovering your true nature. Besides that, I don’t know. The process of training in that, again is not just why the imagination is the capacity of concentration applied to generating mental images. You don’t imagine something, just whatever comes in your mind. It’s very determined by what it’s supposed to be. You just create a mental image and associate with that, the qualities of that. Do you think in terms of the world around us and the difficulties that we have and the kind of future that we need to create that actually if we are able to visualise the future – a just, a fair, a sustainable future – is the ability to visualise that something that is useful? Yes, of course. We’d call that investigation. Analytical mind. And then of course there are inventors. I don’t know if there are Buddhist inventors or not. But that’s part of creativity and inventing new solutions. Again, Buddhists are not at all into artistic imagination. All the art is ruled by very precise rules, like icons. All the deities are of a proportion which means something. You don’t just draw whatever comes in your mind. Maybe that’s why there’s a lot of mental activities linked with mental image, with thinking of the future, with foreseeing which would be the best direction to take. People who study creativity, nothing to do with Buddhism, for example a guy called Scott Barry Kaufman, who wrote ‘Wired to Create’. He says that the state of creativity is actually mutually exclusive with focused attention. Letting your mind be very vast and open, and then some creative idea come up and you see some connection that you didn’t see before. Monk with prayer flags. Golok, Eastern Tibet, 2001. Photo: Matthieu Ricard. That of course happens anyway, if you are a writer. You write on a subject. Suddenly ‘bof’, out of the blue, two ideas that you didn’t know how to connect very well, you see why they are connected. But I would not call that imagination myself. It’s more like a deep investigation that goes sometimes beyond the linear discursive reasoning. Something comes up, but it’s also the result of thinking of them intensively. Analytical mind, but it didn’t come to some sort of state of resolution. You let it brood, and then the solution comes up. You could define that as imagination, but usually in common language, it seems more imagination is imagining something that doesn’t have to be attuned to reality for instance. That’s absolutely no go in Buddhism. It’s called invalid cognition. So that kind of imagination is not considered to be useful. But if it’s just to use the power of mind to either let innovative ideas or connections or concepts come up to the surface, or use the power of mind to visualise clear images, all that, if you call that imagination, fine, but it’s not what usually common language calls imagination I guess. I don’t know, what is your definition of imagination? Yeah, that’s fine. That’s trying to see what actually it could be. That’s a noble aspect of imagination. I myself have just come from a place where I met a lot of great environmentalists. I was with Christiana Figueres and Johan Rockström. So, yes, they are all the time making sort of models, what could be the future. So it’s the noble side of imagination. But they also say there’s so much unknown, but of course you can imagine different possibilities. So that aspect, yes, I think that’s compatible with the Buddhist path because it’s more about trying to figure what this future could be, but not in an imaginative, romantic kind of way, but the closest possible of what could actually happen. Again, I think an analytical mind is probably closer. That, with your analytical mind, that is not only based on what we known now, leaving open for unknowns, for sudden changes, for new ideas and concepts. In a way, scientific discovery is about imagining new way of seeing things, and also imagining a new way of asking new questions. Paro Taksang (the Tiger’s Lair), Bhutan. 2006. 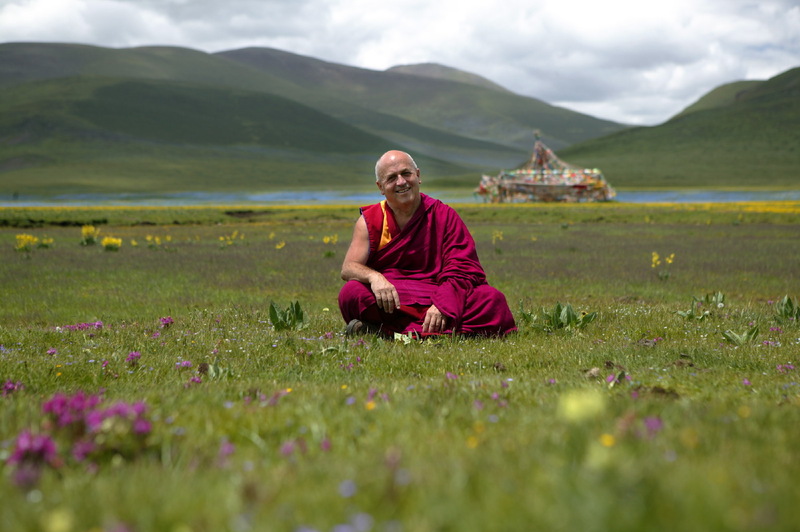 Photo: Matthieu Ricard. I remember meeting a Nobel prize of Physics, Murray Gell-mann, who told me that when you have a mathematical or physical problem, it’s not difficult to solve it. Once your question has been asked, it’s easy to solve. But what is really difficult and creative is to ask the new and right questions. So not just to ask the question to solve the problem, that he said is just a routine. So in that sense, yes. There’s a lot of research that suggests that digital technologies, like smart phones, and social media, are having a really disastrous impact on our attention spans. I wonder how you personally manage a relationship with those technologies, and how do you observe them impacting? It has been shown that multitasking is bad for everything, even for multitasking, to put it clearly. All your cognitive tests are worse than average, even the speed at which you change tasks, which is self-defeating. Well, I try to use it as a tool for activities that are useful, but although there’s a Facebook in my name, Twitter in my name, I don’t know how to get on Facebook, and I don’t know how to get on Twitter, and I will never do. This being said, there are people using the material I have, books, photos, to feed that up. I have no interest. I use email and internet for research, for communicating, and I try to minimise, though it’s certainly more invasive than before, when we used to send letters. It does of course have advantages too. I don’t think we would have done this helping 200,000 people every year without this new means of communication. Do you think that if the Buddha had Twitter, he would have been able to become enlightened if he had been tweeting updates on his progress all the time? But do you think it’s possible now? Are those things compatible? Yeah, part of it is to give it up. I think the Buddha might have got rid of Twitter with his palace. What happens do you think in a culture when we lose our capacity for attention and focus? There have been studies about that. Sherry Turkle studied somehow being alone in the crowd. And kids that say, “Oh, I’m not ready to have a real conversation, maybe one day…” Because, you know, these exchanges are not conversation, just communication, basic things. But conversation between humans involves everything, the facial expression, tone of voice, bodily posture, smiles, whatever, or angry face. It’s totally disembodied in the other way, so that’s drastically impoverishing the human relationship. Then also opening the door to find that if you say something very rash to someone, or rude, you can immediately see the reaction and you either say sorry or you change your tone and you ask for forgiveness. Monks debating at Dzongsar Monastery, Eastern Tibet, 2004. Photo: Matthieu Ricard. But on the internet, there’s nobody reacting on the spot. You don’t have that immediate feedback in front of your face of someone who looks at you and says, “Who is this incredibly rude person?” which you don’t want to feel, to be judged like that. That has opened the doors for cyber bullying, all kinds of stuff. It’s very impoverishing and maybe leading to more extreme forms of communication on all sides. Passion and hatred, and whatever. What have we learnt from what the neuroscience tells us about attention and Buddhism do we think? Buddhism does practice those qualities, and then they can be applied in any kind of setting which is non-Buddhist, of course. There’s no ‘Buddhist attention’, there is Buddhist people specifically cultivating attention, emotional balance, compassion. It happen to be Buddhist, but the attention, the compassion and the emotional balance is something about human nature. So yes, both Buddhist practice and neuroplasticity say if you train in attention, if you train in compassion and if you train in emotional balance, you get better at it. You get more pro-social, you are more attentive, and etcetera. There’s no mystery! Everything else is a result of training, you know, to read and write and play the piano. Now we train with compassion. The fact that’s interesting is that both Buddhist practitioner and the neuroscientists were happy to collaborate, and that it was not just to “prove Buddhism”, this is a ridiculous purpose, but it is nice that it has shown that in many cases, the type of training that Buddhism can offer, actually works, and does change the brain functionally and structurally within weeks, and then the more you do, the more you change. There’s plenty of literature. The book I just came out with, with Wolf Singer, ‘Beyond the Self’ – in French it was called ‘Meditation and the Brain’, different title – there’s a new chapter on that. With Richard Davidson and Antoine Lutz, we did an article in the Scientific American on the effect of meditation. Both in popular literature, and in scientific literature, there’s an enormous amount of data now. Of course, we should not also over-estimate the effect of meditation. There are many studies which are still not very methodologically sound. There’s lots of things which are not very conclusive, but I think all together there are of course things that are conclusive, but we need much more research to be done. Hopefully very vigorously. I would resign the next day. Well, I’m glad of our President, who I happened to meet a few times. He wants to “make the planet great again”, so what can you wish. I would like to make the planet great again, and all sentient beings great again, and 8 million species of animals great again, instead of wholesale massacre of six million animal every hour, all day, every day, every week, every year. That’s totally unacceptable. There’s plenty of misery among humans that we could remedy. Then whatever people are in power, they should have the same amount of care than they have an amount of power. Yeah, I was at the Davos World Economic Forum and there was a dinner, it was called ‘Impossible Food’ and they made some synthetic, very delicious… tastes like meat, I mean, I don’t need it to taste like meat, at all, but it does taste like meat. This thing is taking off very fast in California apparently. What can movements like the movement around climate change can learn from how they present their arguments, in the way that veganism is growing very quickly? It’s mostly a lot about the imagery and the way of communication. Johan Rockström, who is the environmentalist I admire most – he was one of the main scientists who conceived the ‘planetary boundaries’, and I wish we could continue to prosper – he said that environmentalists have failed to communicate enough so that the public doesn’t get discouraged, and also to communicate enough that the solutions are there. They are absolutely there. It’s just a matter of applying them. That’s what is even more frustrating. But the fact that we’re not applying them says it’s a failure of properly communicating and changing the cultural narrative. He’s an incredibly brilliant person. He says that we have to really make special effort to change the narrative so that people are there with that view, and then put those means into action. It is possible but of course we’re not doing it now. That’s the issue. It’s funny – well, not funny – but there’s a doomsday scenario, there’s a way to prevent that, and still we’re not engaging into it. That’s where something has to be done. They all say now the technical means, we have it. My last question was that in the West, we seem to have a real aversion to boredom, and if you get in a lift and there’s more than two floors everybody gets their phone out. In that moment where we think, “Oh, I’m bored, I’ll get my phone out” what do we lose when we fill those moments? I remember a friend of mine who was a Buddhist practitioner waiting for quite some time at a doctor’s waiting room. The other friend said, “Sorry you waited so long.” He said, “I was not waiting.” You cannot be bored if you are not waiting for something else to happen. That’s the problem. I love waiting in airports. First, usually I’m quiet. I have nothing much to do. I cannot start a big work. Trains I love. The six, seven hour train is fantastic. It’s just a quiet time. What’s wrong with that? Of course if you are obsessed with hyperactivity, it can be the opposite of flow. Flow is to engage in something that is not too difficult, not too easy, so you get carried in it. Wooden printing blocks at Derge monastery, Tibet. Photo: Matthieu Ricard. But of course if you are waiting in the line, it’s not very conducive to flow, unless you have inner flow, and that’s what people are missing I think. The outer flow is mostly with activity: painting, doing surgery, climbing mountains, sailing, whatever. But I talked with Mihaly Csíkszentmihályi, who is the one to define that concept of flow, which is wonderful. You can apply everything to meditation except the physical action. So if you can get inner flow, then you are not waiting anywhere. How can you be bored? Boring is people who have not realised the incredibly richness of just resting in the mind. There’s nothing to be bored, so I just do some mental practice, recite some prayers, or whatever. I wish there would be enough time to be bored. My ideal situation is 24 hours boredom all year round. Sitting on the balcony of my hermitage, watching the Himalaya, if you call that boredom, that’s fine enough with me.